For sheer emotional resonance, the highlight of the National Endowment for the Arts’ Jazz Masters ceremony-concert at Jazz at Lincoln Center’s Rose Hall, in October, was probably the opening procession, as past and present recipients of the $25,000 prize marched down the aisles to their seats. Accompanied by a sustained, standing, often roaring ovation, the mostly aged, occasionally halting parade of nearly two dozen musicians was, in the best sense of the term, Fellini-esque: a dreamlike amble of men (the four living women recipients were not present) whom we have enjoyed, admired, respected and venerated all our lives. Their number and the history they represent demanded the salute we too infrequently get to render. After a radiant blast of Bud Powell’s “Un Poco Loco” by the Jazz at Lincoln Center Orchestra (arranger uncredited), Wynton Marsalis and Dana Gioia made a couple of speeches, setting up the evening’s plan. This consisted of introducing new recipients for 2009-George Benson, Jimmy Cobb, Lee Konitz, Toots Thielemans, Rudy Van Gelder, Snooky Young-with a filmed salute, an introduction by a past recipient, followed by the current Jazz Master saying a few words and, in most cases, performing a number with the JLCO. All seven of the musical numbers were savory, particularly the concerto arrangement of “Body and Soul,” featuring Konitz, though the audience preferred Thielemans’ “What a Wonderful World.” For comic élan, no one could ace Phil Woods, who introduced Konitz with written comments, because, he explained, “My memory is very good but extremely short.” Marsalis closed the program with “Li’l Darlin'” in graceful tribute to Neal Hefti, who died the previous week, at 85, never having been designated a Jazz Master. For Gioia, who recently announced his departure from the NEA to return to his writing (he is a prizewinning poet), the evening must have been bittersweet; indeed, he seemed reluctant to let it go. As chairman for the National Endowment for the Arts, Gioia revived a moribund institution not least by revving up its involvement in jazz. 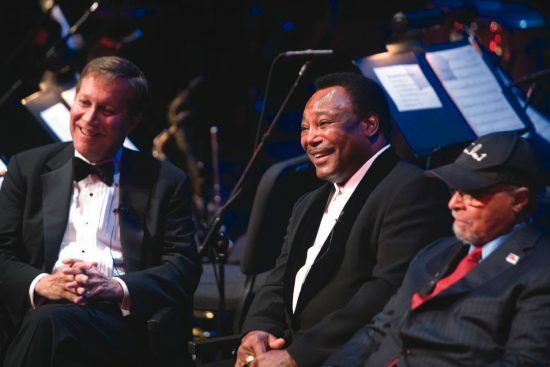 When the Jazz Masters program began in 1982, it honored three artists per year. 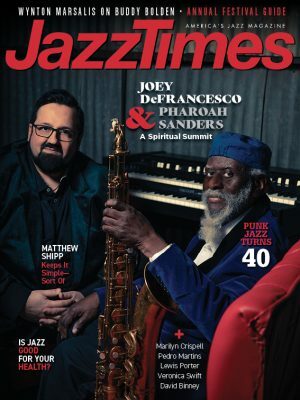 After taking over in 2003, Gioia doubled that number (sometimes bringing it to seven), increased the prize money to make it a meaningful honor, added a category for jazz-enabling non-musicians (hence Van Gelder), and instigated touring, educational and archival programs-you can find NEA-funded interviews with jazz legends as online PDF files. If he has garnered any bad publicity-rock-ribbed crazies who think government has no place in the arts except to give corporations perpetual copyrights don’t count-it has passed me by. The fact is that jazz, despite its ludicrously low domestic profile, never fails to mask hard times. I think it was Murray Kempton who observed that the only totally unsullied evening in the Nixon White House was occasioned by its celebration of Duke Ellington’s 70th birthday. George Wein has noted that almost every major municipality in the world welcomes a jazz festival-it raises commerce and good vibes. The Depression was the only time in Hollywood history when movies bannered swing bands on marquees to represent cheerful American optimism; before and after the Depression, jazz appeared in films to indicate loose morals and lost souls. Of course, Hollywood’s all-time favorite orchestra was Xavier Cugat, but still. If the economy continues to pan out as the pundits threaten, jazz may actually regain commercial significance. Even given his many successes, the Rose Hall event must have been a particular plum for Gioia. The mechanics were fairly complicated, what with the balance of films, talk and music, but, notwithstanding a few brief pauses that Marsalis effortlessly riffed through, they came off without a hitch-close enough for opera, you could say. The orchestra is now pretty much beyond cavil, the guests were delighted, and the audience was willing to rise with greater frequency than any religious service could require. It ought to be an annual New York event. As for Gioia, who has been literary, corporate and political, and decided literary is better, may he awake with the muse shouting in his ears. And may his successor be worthy. With the Democrats in charge, the NEA ought to have an easier time, and the new administration must keep jazz as a priority in appointing a new chairperson. Yet much as I applaud the NEA, there is a part of me that left the evening with a hollow heart. Is the future of jazz to be nothing but government backpatting and educational initiatives? Will there never be the jazz equivalent of Seattle’s EMP, Cleveland’s rock museum or Nashville’s Opry? Jazz at Lincoln Center is itself an historic (if still not as inclusive at it might be) step in the right direction, but can we have no better jazz hall of fame than its closet-with-plaques? How long till the National Museum in Harlem has a home worthy of its mandate? Can we have no commercial jazz radio and television network? To how many hundreds of cable stations must we subscribe before we can have one dedicated to jazz? What does Warren Buffett listen to anyway?